Yes because all they will do is give you Prescriptions that will have millions of side effects!! It seems like I run on full speed then something comes and knocks you down and making you think I best slow down a bit. These last 8 months have been very eye opening for me. Rebuild that motor! do some body work. Replace that rear,, frontend alignment might be needed too !!!! It's all the same !! 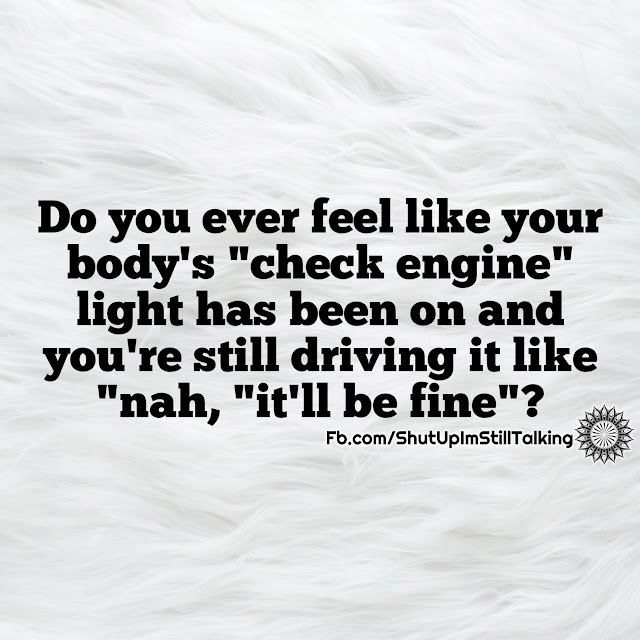 Your Body is like CHECK ENGINE picture/image is an Inspirational Stuff to Inspire and Motivate You. You can download pics by just clicking on the Images. Thanks for visiting Truth Follower an online place for huge collection of inspiring pictures, quotation, and Sayings Images. If you like Your Body is like CHECK ENGINE, Please Share with friends and family on Facebook, Twitter, and Pinterest.